Shlapatska L.M., Kovalevska L.M., Gordiienko I.M., Sidorenko S.P. Summary. Background: X-linked lymphoproliferative disease type 1 (XLP1) belongs to genetically determined primary immunodeficiency syndromes with mutations in SH2D1A/DSHP/SAP gene. The dramatic increase of the risk of B-cell lymphoma development in XLP1 patients is linked not only to SAP deficiency of NK, NKT and T cells, but probably to the impairment of B cell differentiation. Aim: To analyze the receptor-mediated Akt/PKB and ERK1/2 phosphorylation and expression of transcription factors that are involved in B cell maturation in EBV-transformed B-lymphoblastoid cell lines (B-LCLs) from XLP1 patients (XLP B-LCLs) in comparison with conventional B-LCLs. 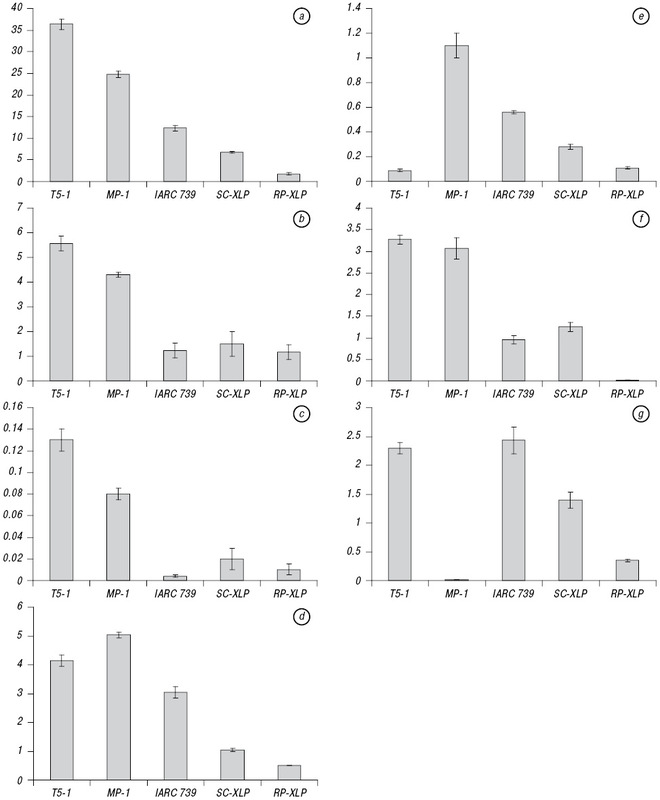 Methods: Studies were performed on EBV-transformed XLP B-LCLs IARC 739, SC-XLP and RP-XLP in comparison with SAP-negative B-LCL T5-1 and SAP-positive B-LCL MP-1. 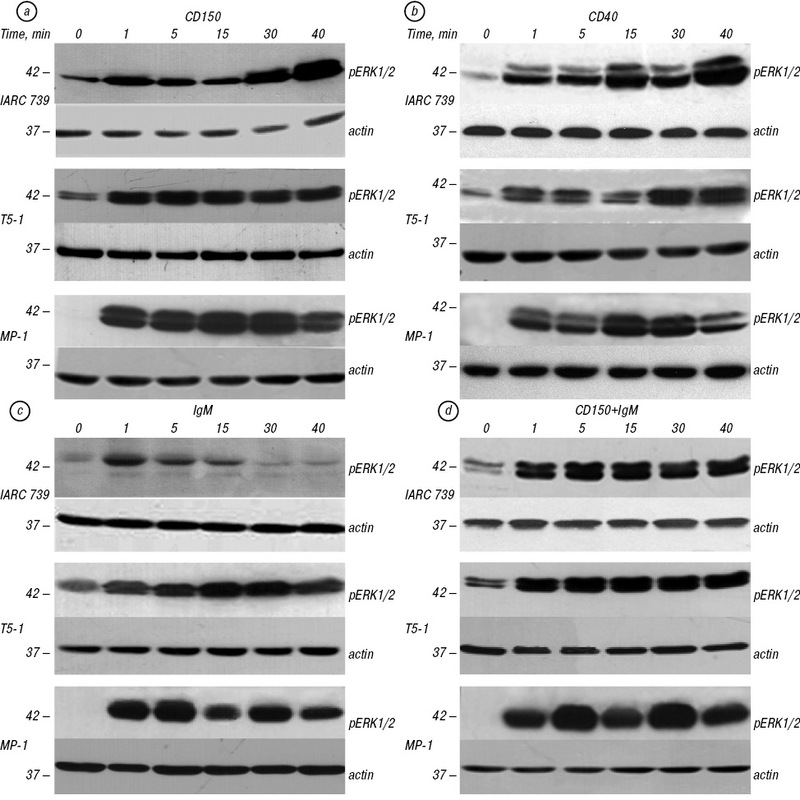 Western blot analysis was used for evaluation of Akt (Ser473) and ERK1/2 (Thr202/Tyr204) phosphorylation in response to ligation of CD150, CD40, and IgM cell surface receptors. The expression levels of transcription factors IRF4, IRF8, BCL6, BLIMP1, SPIB, PU.1 and MITF were assessed using quantitative RT-PCR. Results: It was shown that SAP deficiency in XLP B-LCL did not abrogate CD150-mediated Akt and ERK1/2 phosphorylation. At the same time, ligation of CD150 or IgM affects kinetics and amplitude of ERK1/2 activation. In XLP B-LCL the CD150 signaling with IgM coligation play the dominant role in both Akt and ERK1/2 phosphorylation. We found that significantly reduced IRF4, IRF8 and PU.1 expression levels are the key features of XLP B-LCLs. Conclusion: XLP B-LCLs and conventional B-LCLs have differences in kinetics and amplitude of Akt and ERK1/2 phosphorylation. Analysis of transcription factors profile revealed the distinguishing features of XLP B-LCLs with SAP deficiency that may impair B cell differentiation.Key Words: B-lymphoblastoid cell lines, X-linked lymphoproliferative disease type 1, CD150, CD40, BCR, Akt/PKB, ERK1/2, transcription factors. Abbreviations used: BCR — B-cell receptor; B-LCLs — B-lymphoblastoid cell lines; EBV — Epstein — Barr virus; ITSM — immunoreceptor tyrosine-based switch motif; SAP — SLAM-associated protein; SH2D1A — SH2 domain protein 1A; XLP1 — X-linked lymphoproliferative disease type 1; XLP B-LCLs — B-lymphoblastoid cell lines from XLP1 patients. X-linked lymphoproliferative disease type 1 (XLP1) belongs to X-linked genetically determined primary immunodeficiency syndromes and is characterized by mutations in SH2D1A/DSHP/SAP gene [1–3]. SH2D1A gene encodes a small 128 aa adaptor protein SH2 domain protein 1A (SH2D1A), also called Duncan’s disease SH2-protein (DSHP) or SLAM-associated protein (SAP) [4–6]. SAP was first identified as an adaptor protein interacting with signaling lymphocyte activation molecule (SLAM)/CD150 . This SH2 domain-containing adaptor protein inte­racts with six members of SLAM family receptors by binding to conserved immunoreceptor tyrosine-based switch motif (ITSM) and recruiting Src-family kinases [2, 7–9]. It was shown that SAP is involved in regulation of development and functions of T lymphocytes, NKT and NK cells [10–14]. XLP is characte­rized by extreme vulnerability to Epstein – Barr virus (EBV) infection. Symptoms of EBV infection are typically mild and often indistinguishable from other mild common illnesses . During primary infection, EBV infects and activates resting naive B-cells, which then transit through the germinal center to become resting memory B-cells where the virus resides quiescently. The ability of EBV to restrict expression of its genes allows the virus to persist in vivo within resting memory B cells and maintain a lifelong infection. Elimination of EBV-infected proliferating B cells is under control of cytotoxic T lymphocytes, NK and NKT cells [16, 17]. XLP1 patients have increased susceptibility to primary EBV infection and developed a fulminant form of infectious mononucleosis with high rate of mortality. Other clinical characteristics are: uncontrolled proliferation of EBV infected B cells, lack of class-switched memory B cells, development of dysgammaglobulinaemia and lymphoma of B cell origin [1, 18–21]. Results of SAP-deficiency studies suggested that defects in deve­lopment and/or functions of CD8+ T lymphocytes, NK, and NKT cells are responsible for failure of EBV-infected B cells elimination [2, 3, 22]. However, several XLP1 clinical features, inclu­ding lymphoma development, in many cases are EBV independent [23–25]. It should be noted that the risk for B-cell lymphoma development in XLP1 patients is increased 200-fold . A number of evidence [8, 27–33] support the idea that SAP is involved in B cell differentiation and function, so the absence of functional SAP in XLP1 may affect the B cells as well. Our previous publication present the proofs of intrinsic defect in B-lymphoblastoid cell lines (B-LCLs) derived from XLP1 patients . We used the EBV-transformed B-LCLs as an important model for studying cellular transformation, especially B-LCLs from XLP1 patients. Our studies revealed cell surface phenotype and functional features that distinguish XLP B-LCLs from conventional B-LCLs. The major functional differences are in the modulation of CD95 apoptosis via CD40 and CD150 receptors and unresponsiveness to proliferative signals triggered by CD40 or coligation BCR with CD150 in XLP B-LCLs . Current study covers some cell sig­naling events that may underlie functional peculiarities of XLP B-LCLs, and transcription factors expression profile of XLP B-LCLs in comparison with conventional ­B-LCLs. Since CD150 is a major SAP interacting receptor and is linked to Akt/PKB and ERK1/2 pathways [27, 28], here we focused on receptor-mediated Akt/PKB and ERK1/2 phosphorylation. SAP deficiency could also affect B-cell maturation. That is why, expression studies embrace seven transcription factors that are involved in B lymphocytes differentiation. Cell lines and stimulation. Studies were performed on EBV-transformed B-LCL T5-1 (SAP-ne­gative on protein level); SAP-positive B-LCL MP-1 (provided by Prof. E.A. Clark, USA); and EBV-transformed B-LCLs from XLP1 patients: IARC 739 (interstitial deletion of SH2D1A) , SC-XLP (S28R) , and RP-XLP (R55X), all kindly provided by Prof. K.E. Ni­chols (USA). Cell lines were maintained as previously described . For crosslinking of surface receptors, we used the following monoclonal antibodies (mAbs): IPO-3 anti-CD150 (IgG1) (IEPOR NANU) and G28-5 anti-CD40 (IgG1) (kind gift of Prof. E.A. Clark, USA). F(ab)’2 of goat anti-human IgM (Jackson ImmunoResearch Laboratories, Inc., USA) were used for IgM crosslinking on human B cell lines. Following final concentrations of antibodies were used: 0.5 μg/ml anti-CD40, 1.0 μg/ml anti-CD95, 10.0 μg/ml anti-CD150, and 10.0 μg/ml anti-IgM. Biochemical methods. Cell stimulation via cell surface receptors were stopped by cold PBS with 0.1% NaN3, washed with the same solution, and cell pellets were lysed in Triton lysis buffer (150 mM NaCl, 1 mM EDTA, 1 mM EGTA, 20 mM Tris, pH 8.0, 1% Triton Х100) containing cocktails of protease and phosphatase inhibitors (Sigma, USA). Lysates were subjected to sodium dodecyl sulfate polyacrylamide gel electrophoresis. Proteins were transferred to Immobilon-NC membranes (Millipore, USA) and blocked overnight with 5% nonfat dried milk in tris-buffered saline with tween 20 (TBS-T). Membranes were incubated with primary antisera at 4 °C for 12 h and with secondary antibodies for 2 h. Primary antibodies, rabbit anti-pAkt (Ser473) and anti-phosphorylated ERK1/2 (Thr202/Tyr204), were purchased from Cell Signaling Technology (Beverly, MA, USA). Secon­dary goat anti-rabbit HRP-conjugated antibodies were from Santa Cruz Biotechnology (USA). Clarity Western ECL substrate (Immunо-Star HRP, BioRad, USA) and medical X-ray film (AGFA, Belgium) were used for visualization of immunoreactions. Quantitative RT-PCR. Total RNA was isolated from cells using TRI reagent (Sigma-Aldrich, St. Louis, MO, USA). Approximately 2 μg of total RNA were reverse transcribed with RevertAid Reverse Transcriptase, RiboLock RNase Inhibitor (Thermo Scientific, USA), and Oligo(dT)23 anchored primer (Sigma-Aldrich, St. Louis, MO, USA) according to manufacturer’s protocol. cDNA obtained was used for real-time PCR. Real-time PCR was performed using Maxima SYBR Green/ROX qPCR Master Mix (Thermo Scientific, USA) on a sequence detection system 7500 (Applied Biosystems, Foster City, CA, USA). Samples were normalized to β2-microglobulin expression. Primer design was performed using Primer Design and Search Tool (http://bisearch.enzim.hu). The specificity of primers was verified using nucleotide-nucleotide alignment option (blastn) in BLAST internet program (http://www.ncbi.nlm.nih.gov/BLAST/). The pri­mers for real time PCR are listed in the Table. The PCR cycling conditions were the following: 10 min at 95 °C, 40 cycles of 15 s at 95 °C and 40 s at 62 °C. Applied Biosystems 7500 system software was used for analysis. Ct values were determined for the internal control (­β2-microglobulin) and the test genes at the same threshold level in the exponential phase of the PCR curves. Relative quantification (comparative Ct (ddCt) method) was used to compare the expression level of the test genes with the internal control. Dissociation curve analysis was performed after every run to check the specificity of the reaction. In all, 3–5 reactions (each in triplicates) were run for each gene and a standard deviation was calculated. To clarify the signaling events that may explain the functional differences of EBV-transformed ­B-LCLs from XLP1 patients and conventional B-LCLs, we analyzed the kinetics of receptor-mediated Akt phosphorylation on S473 and ERK1/2 phosphorylation on Thr202/Tyr204 that reflect activation of these kinases. There kinases were shown to be activated via CD150, which interacts with SAP , and are involved in regulation of cell survival and proliferation [37, 38]. In these experiments we compared XLP B-LCL IARC 739 (interstitial deletion of SH2D1A), with conventional B-LCLs T5-1 (SAP negative on protein level) and MP-1 (SAP positive on protein level). For receptor ligation we used antibodies against CD150, CD40 and B-cell receptor (IgM), and also coligation of CD150 with IgM. In these studies on receptor-mediated Akt and ERK1/2 phosphorylation we would like to find answers to following questions: (i) whether SAP deficiency affect CD150-mediated signaling, (ii) if SAP deficiency influences the kinetics and amplitude of Akt and ERK1/2 phosphorylation that is initiated via CD40 and IgM, (iii) whether SAP positive and SAP negative ­B-LCLs have differences in receptor-mediated Akt and ERK1/2 activation. As shown on Fig.1, a, CD150 crosslinking induced rapid and sustained Akt phosphorylation in XLP ­B-LCL IARC 739. Kinetics of Akt phosphorylation after CD40 or IgM ligation on these XLP cells was similar, however activation amplitude was slightly higher, compared with CD150 ligation (Fig. 1, b, c). At the same time, kinetics of pAkt after CD150 and IgM coligation remained on the level of CD150 alone (Fig. 1, d). The peak of Akt phosphorylation was observed at 30 min in all variants of receptor ligation (see Fig. 1, a–d). CD150-mediated ERK1/2 activation, similarly to Akt phosphorylation, was not abrogated in XLP SAP-deficient B-LCL IARC 739 (Fig. 2, a). pERK1/2 increased at 1 min already, however, the second wave of ERK1/2 activation was started at 30 min after receptor ligation (see Fig. 2, a). Much higher amplitude of ERK1/2 phosphorylation started from 1 min was detected as a result of CD40 signaling (Fig. 2, b). It should be noted that IgM ligation on XLP SAP-deficient B-LCL IARC 739 mediated very rapid, but transient ERK1/2 activation (Fig. 2, c). However, IgM and CD150 coligation resulted in rapid intense and sustained ERK1/2 phosphorylation (Fig. 2, d). Comparison of SAP+ and SAP− conventional ­B-LCLs showed their differences in receptor-initiated Akt phosphorylation. First, SAP− cell line T5-1 has elevated basal levels of both Akt and ERK1/2 phosphorylation (see Fig. 1, a–d and Fig. 2, a–d). In T5-1 cells CD150 ligation induce the most rapid Akt phosphorylation (see Fig. 1, a), after IgM crosslinking the peak of this enzyme activation was at 15 min (see Fig. 1, c), and coligation if these receptors did not show sy­ne­r­gistic effect (see Fig. 1, d). Receptor-mediated kinetics and amplitude of Akt phosphorylation in SAP+ MP-1 cell significantly differ from SAP− cells T5-1 (see Fig. 1, a–b). CD40 ligation on T5-1 cells resulted in very late Akt phosphorylation — at 60 min, while in SAP+ cells MP-1 pAkt was observed already at 1 min (see Fig. 1, b). On the contrary, IgM-induced kinetics and amplitude of Akt phosphorylation in MP-1 cells was much lover, than in T5-1 cells (see Fig. 1, c). At the same time, coligation of CD150 with IgM had synergistic effect on Akt phosphorylation in SAP+ cells MP-1 (see Fig. 1, d). Kinetics and amplitude of ERK1/2 phosphorylation induced by all variants of receptor ligation was similar in both SAP+ and SAP− conventional B-LCLs cell lines (see Fig. 2, a–d). It should be noted slight additive effect of CD150 and IgM coligation (see Fig. 2, d). Summary for this fragment of studies: 1) SAP deficiency in XLP B-LCL did not abrogate CD150-mediated Akt and ERK1/2 phosphorylation; 2) CD150 crosslinking on XLP B-LCL IARC 739 led to two waves of ERK1/2 phosphorylation; 3) IgM ligation on SAP deficient XLP B-LCL IARC 739 resulted in short transient ERK1/2 activation; 4) CD150 signaling in XLP B-LCL diminished the amplitude of IgM-mediated Akt phosphorylation; 5) SAP+ and SAP− conventional B-LCLs have differences in kinetics and amplitude of receptor-initiated Akt phosphorylation. Comparative analysis of receptor-mediated Akt and ERK1/2 phosphorylation in XLP and conventional B-LCL and functional characteristics of these cell lines  did not reveal direct correlations. Akt and ERK1/2 pathways are the main regulators of cell survival and proliferation in early B-cell development . However, during naïve B cell activation and differentiation when the EBV receptor CD21 is expressed, in addition to Akt and ERK1/2, other pathways are involved in regulation of cell proliferation, especially p38 MAPK [38, 39]. Since signaling pathways create a joint metabolic network, it seems unlikely to find a particular and even several pathways that are responsible for functional differences between XLP and conventional B-LCL. At the same time the divergence of XLP and conventional B-LCLs may be stipulated by disturbance of B cell differentiation due to SAP deficiency. B cell maturation is a process of coordinated transition of exclusive gene-expression programs that is orchestrated by specific transcription factors network. To address the question whether SAP deficiency may affect the B cell differentiation we studied the limited expression profile of transcription factors that play a key role in B cell differentiation during the germinal center transition and plasma cell development. These include: IRF4, IRF8, BCL6, BLIMP1, MITF, PU.1, and SPIB trans­cription factors. Interferon regulatory factors 4 and 8 (IRF4 and IRF8) are highly homologous to each other and are expressed exclusively in cells of the immune system [40, 41]. They are characterized by differential expression during B cell development that underlies their synergistic or mutual exclusive func­tioning [40, 41]. It was shown that IRF4 and IRF8 are acting synergistically at the small pre-B stage providing regulation of rearrangement and transcription of Igκ, inhibition of pre-B cell proliferation and promotion of pre-B cells migration away from IL-7 enriched bone marrow stromal cells [42, 43]. At the same time, du­ring the antigen-dependent stage of B-cell development IRF4 and IRF8 have a differential expression. IRF4 is expressed on all stages of B cell maturation except the germinal center transition, however its expression is upregulated on centrocyte stage during exit from the germinal center . It was shown that IRF4 plays a critical role in at least three key deve­lopmental processes: the termination of the germinal center B-cell transcriptional program, immunoglobulin class switch recombination, and plasma cell deve­lopment . In contrary, germinal center B cells, particularly centroblasts, are ­cha­racterized by the highest level of IRF8 expression [40, 41]. IRF8 is the only transcription factor shown to be involved in transcriptional induction of a master regulator of germinal center reaction BCL6, a transcriptional repressor that is expressed and acts in mature germinal center B cells and also in subpopulation of naïve B lymphocytes . BCL6 transcription is directly repressed by IRF4 that binds to multiple sites in BCL6 promoter region . On the other hand, IRF4 positively regulates expression of BLIMP1 (B-lympocyte-induced maturation protein 1) — another transcription factor that also is involved in development and maintaining plasma cell phenotype, particularly by repression of BCL6 [42, 45]. In turn, BLIMP1 is a positive regulator of IRF4 , while MITF (microphthalmia-associated transcription factor) serves as its negative regulator . MITF is essential to maintain naïve B cell program and inhibit plasma cell differentiation . EBV transformed B-LCLs are characterized by ele­vated level of IRF4 expression and signaling via EBV latent membrane protein 1 (LMP-1) is responsible for IRF4 upregulation . Indeed, in our studies the high level of IRF4 expression was detected in conventional B-LCLs T5-1 and MP-1 (Fig. 3, a). However, all three tested EBV-transformed XLP B-LCLs had significantly lower level of IRF4 expression (see Fig. 3, a). Since at this stage of differentiation IRF4 and IRF8 expression levels are inversed, the high level of IRF8 mRNA in XLP B-LCLs could be expected. But, in XLP B-LCLs IRF8 expression levels, similarly to IRF4, were also significantly lower than in conventional B-LCLs (Fig. 3, b). BCL6 expression level in all tested B-LCLs was the lo­west between all tested transcription factors, moreover, in XLP LCLs it was on the border of detection (Fig. 3, c) that correlated with the level of IRF8 mRNA (see Fig. 3, b). We did not reveal the strong correlation between IRF4 and BLIMP1 expression levels, but the lowest levels of both transcription factors were found for two XLP B-LCLs SC-XLP and ­RP-XLP (see Fig. 3, a, d). The expression levels of MITF, the negative regulator of IRF4, also did not correlate with the IRF4 mRNA levels (Fig. 3, e). IRF4 and IRF8 by interaction with other transcription factors may activate or repress gene expression. The best-characterized interacting partners of IRF4 and IRF8 are the Ets transcription factor family members PU.1 and SPIB [40, 42]. They also are involved in regulation of B cell viability after BCR crosslinking . It should be noted that PU.1 mRNA levels were significantly lower in XLP B-LCLs than in conventional B-LCLs (Fig. 3, f). Thus, in B-LCLs the expression levels of PU.1 (see Fig. 3, f), but not SPIB (Fig. 3, g), correlate with IRF4 and IRF8 expression profile (see Fig. 3, a, b). It should be noted that conventional B-LCL MP-1, which express SAP on protein level, demonstrated elevated expression level of MITF, while SPIB was practically undetectable in this cell line (see Fig. 3, e, g). On the other hand, cell lines T5-1 (does not express SAP on protein level) and XLP B-LCL IARC 739 (also does not express SAP due to interstitial deletion of SH2D1A) were characterized by the highest level of SPIB expression (see Fig. 3, g). Taking together, our analysis of transcription factors profile in EBV-transformed B-LCLs revealed the distinguishing features of XLP B-LCLs with SAP deficiency that may affect B cell differentiation. We found that significantly reduced IRF4 and PU.1 expression levels are the key features of XLP B-LCLs. In mature B cells CD40 and BCR are involved in upregulation of IRF4 expression [40, 42]. So, functional impairment of CD40- and BCR-mediated signaling in XLP ­B-LCLs  and diminished expression levels of IRF4 and IRF8, as well as their interacting partner PU.1, may be the links in common metabolic chain that is crucial for B-cell maturation during germinal center transition. Several lines of evidence are supporting the idea that B cells in XLP1 may have an intrinsic defect. First, SAP is expressed in several subsets of normal and malignant human and mouse B cells and B cell lines [8, 27–33]. Second, B cells from SAP-deficient mice have functional impairment in vivo and in vitro [30, 49]. Third, XLP1 patients fail to produce germinal center derived memory B cells, but harbor latent virus in the IgD+IgM+CD27+ subpopulation [17, 19], that may reflect the impairment of germinal center maturation due to the functional defects in T ­and/­or B cells . Fourth, the cell surface phenotype and functional features that distinguish SAP-deficient XLP B-LCLs from conventional B-LCLs were revealed. The major functional differences concern the modulation of CD95 apoptosis via CD40 and CD150 receptors and unresponsiveness to proliferative signals triggered by CD40 or colligation of BCR with CD150 . Fifth, XLP and conventional B-LCL have differences in kine­tics and amplitude of Akt and ERK1/2 phosphorylation. In XLP B-LCL the dominant role of CD150 signaling in colligation with IgM should be emphasized (see Fig. 1, 2). Sixth, XLP B-LCL had a significantly reduced IRF4, IRF8 and PU.1 expression levels (see Fig. 3) that imply for impairment of SAP-deficient B cell differentiation. When during B cell maturation the lack of SAP expression or its mulfunction could affect B cell differentiation? It was shown that SAP is a target gene of wt p53 . Recently it was found that p53 is required for elimination of pre-B cells that failed to productively rearrange immunoglobulin VH-DJH gene segments . The transcriptional activation of p53 is mediated by Bach2, which competes with BCL6 for promoter binding, and reverses BCL6-mediated repression of p53 . Moreover, BCL6 suppresses p53 expression in germinal center B cells . However, at this stage of differentiation endogenous p53 can be activated by genotoxic agents in Burkitt lymphoma and B-LCLs, which induce SAP expression via wt p53 . Thus, at least at two stages of B-cell maturation the defect in SAP function may affect B cell maturation and/or functions. This impairment of B cell maturation may underlie the dramatic increase of B-cell lymphoma frequency in patients with XLP1. The authors are thankful to Prof. E.A. Clark and Prof. K.E. Nichols for providing cell lines. This study has been supported by fundamental complex program of scientific research of Division of Biochemistry, Physiology and Molecular Biology NAS of Ukraine “Functional genomics and metabolomics in system biology” (№ 0112U002196) and NAS of Ukraine project 0110U006647. 1. Filipovich AH, Zhang K, Snow AL, et al. X-linked lymphoproliferative syndromes: brothers or distant cousins? Blood 2010; 116: 3398–408. 2. Cannons JL, Tangye SG, Schwartzberg PL. SLAM family receptors and SAP adaptors in immunity. Annu Rev Immunol 2011; 29: 665–705. 3. Veillette A, Perez-Quintero LA, Latour S. X-linked lymphoproliferative syndromes and related autosomal recessive disorders. Curr Opin Allergy Clin Immunol 2013; 13: 614–22. 4. Coffey AJ, Brooksbank RA, Brandau O, et al. Host response to EBV infection in X-linked lymphoproliferative disease results from mutations in an SH2-domain encoding gene. Nat Genet 1998; 20: 129–35. 5. Nichols KE, Harkin DP, Levitz S, et al. Inactivating mutations in an SH2 domain-encoding gene in X-linked lymphoproliferative syndrome. Proc Natl Acad Sci U S A 1998; 95: 13765–70. 6. Sayos J, Wu C, Morra M, et al. The X-linked lympho­proliferative-disease gene product SAP regulates signals induced through the co-receptor SLAM. Nature 1998; 395: 462–9. 7. Latour S, Roncagalli R, Chen R, et al. Binding of SAP SH2 domain to FynT SH3 domain reveals a novel mechanism of receptor signalling in immune regulation. Nat Cell Biol 2003; 5: 149–54. 8. Li C, Chung B, Tao J, et al. The X-linked lymphoproliferative syndrome gene product SAP regulates B cell function through the FcgammaRIIB receptor. Cell Signal 2008; 20: 1960–7. 9. Veillette A. SLAM-family receptors: immune regulators with or without SAP-family adaptors. Cold Spring Harb Perspect Biol 2010; 2: a002469. 10. Nichols KE, Hom J, Gong SY, et al. Regulation of NKT cell development by SAP, the protein defective in XLP. Nat Med 2005; 11: 340–5. 11. Nichols KE, Ma CS, Cannons JL, et al. Molecular and cellular pathogenesis of X-linked lymphoproliferative disease. Immunol Rev 2005; 203: 180–99. 12. Dupre L, Andolfi G, Tangye SG, et al. SAP controls the cytolytic activity of CD8+ T cells against EBV-infected cells. Blood 2005; 105: 4383–9. 13. Snow AL, Marsh RA, Krummey SM, et al. Resti­mulation-induced apoptosis of T cells is impaired in patients with X-linked lymphoproliferative disease caused by SAP deficiency. J Clin Invest 2009; 119: 2976–89. 14. Madapura HS, Salamon D, Wiman KG, et al. p53 contributes to T cell homeostasis through the induction of pro-apoptotic SAP. Cell Cycle 2012; 11: 4563–9. 15. Thorley-Lawson DA. Epstein — Barr virus: exploiting the immune system. Nat Rev Immunol 2001; 1: 75–82. 16. Hawkins JB, Delgado-Eckert E, Thorley-Lawson DA, et al. The cycle of EBV infection explains persistence, the sizes of the infected cell populations and which come under CTL regulation. PLoS Pathog 2013; 9: e1003685. 17. Thorley-Lawson DA, Hawkins JB, Tracy SI, et al. The pathogenesis of Epstein — Barr virus persistent infection. Curr Opin Virol 2013; 3: 227–32. 18. Rezaei N, Mahmoudi E, Aghamohammadi A, et al. X-linked lymphoproliferative syndrome: a genetic condition typified by the triad of infection, immunodeficiency and lymphoma. Br J Haematol 2011; 152: 13–30. 19. Chaganti S, Ma CS, Bell AI, et al. Epstein — Barr virus persistence in the absence of conventional memory B cells: IgM+IgD+CD27+ B cells harbor the virus in X-linked lymphoproliferative disease patients. Blood 2008; 112: 672–9. 20. Ma CS, Pittaluga S, Avery DT, et al. Selective generation of functional somatically mutated IgM+CD27+, but not Ig isotype-switched, memory B cells in X-linked lymphoproliferative disease. J Clin Invest 2006; 116: 322–33. 21. Booth C, Gilmour KC, Veys P, et al. X-linked lymphoproliferative disease due to SAP/SH2D1A deficiency: a multicenter study on the manifestations, management and outcome of the disease. Blood 2011; 117: 53–62. 22. Bassiri H, Janice Yeo WC, Rothman J, et al. X-linked lymphoproliferative disease (XLP): a model of impaired anti-viral, anti-tumor and humoral immune responses. Immunol Res 2008; 42: 145–59. 23. Brandau O, Schuster V, Weiss M, et al. Epstein — Barr virus-negative boys with non-Hodgkin lymphoma are mutated in the SH2D1A gene, as are patients with X-linked lympho­proliferative disease (XLP). Hum Mol Genet 1999; 8: 2407–13. 24. Sumegi J, Huang D, Lanyi A, et al. Correlation of mutations of the SH2D1A gene and Epstein — Barr virus infection with clinical phenotype and outcome in X-linked lymphoproliferative disease. Blood 2000; 96: 3118–25. 25. Sumegi J, Seemayer TA, Huang D, et al. A spectrum of mutations in SH2D1A that causes X-linked lymphoproliferative disease and other Epstein — Barr virus-associated illnesses. Leuk Lymphoma 2002; 43: 1189–201. 26. Nagy N, Klein E. Deficiency of the proapoptotic SAP function in X-linked lymphoproliferative disease aggravates Epstein — Barr virus (EBV) induced mononucleosis and promotes lymphoma development. Immunol Lett 2010; 130: 13–8. 27. Mikhalap SV, Shlapatska LM, Berdova AG, et al. 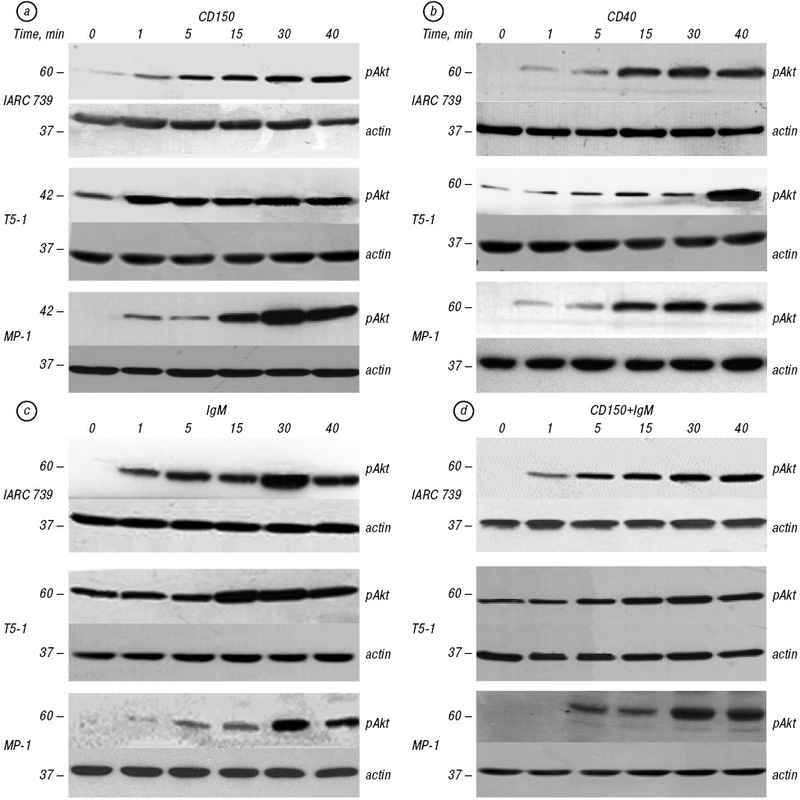 CDw150 associates with src-homology 2-containing inositol phosphatase and modulates CD95-mediated apoptosis. J Immunol 1999; 162: 5719–27. 28. Mikhalap SV, Shlapatska LM, Yurchenko OV, et al. The adaptor protein SH2D1A regulates signaling through CD150 (SLAM) in B cells. Blood 2004; 104: 4063–70. 29. Shlapatska LM, Mikhalap SV, Berdova AG, et al. CD150 association with either the SH2-containing inositol phosphatase or the SH2-containing protein tyrosine phosphatase is regulated by the adaptor protein SH2D1A. J Immunol 2001; 166: 5480–7. 30. Morra M, Barrington RA, Abadia-Molina AC, et al. Defective B cell responses in the absence of SH2D1A. Proc Natl Acad Sci USA 2005; 102: 4819–23. 31. Nagy N, Maeda A, Bandobashi K, et al. SH2D1A expression in Burkitt lymphoma cells is restricted to EBV positive group I lines and is downregulated in parallel with immunoblastic transformation. Int J Cancer 2002; 100: 433–40. 32. Nagy N, Takahara M, Nishikawa J, et al. Wild-type p53 activates SAP expression in lymphoid cells. Oncogene 2004; 23: 8563–70. 33. Ostrakhovitch EA, Wang Y, Li SS. SAP binds to CD22 and regulates B cell inhibitory signaling and calcium flux. Cell Signal 2009; 21: 540–50. 34. Shlapatska LM, Kovalevska LM, Gordiienko IM, et al. Intrinsic defect in B-lymphoblastoid cell lines from patients with X-linked lymphoproliferative disease type 1. I. Cell surface phenotype and functional studies. Exp Oncol 2014; 36: 2–8. 35. Malbran A, Belmonte L, Ruibal-Ares B, et al. Loss of circulating CD27+ memory B cells and CCR4+ T cells occurring in association with elevated EBV loads in XLP patients surviving primary EBV infection. Blood 2004; 103: 1625–31. 36. Sidorenko SP, Clark EA. The dual-function CD150 receptor subfamily: the viral attraction. Nat Immunol 2003; 4: 19–24. 37. Reth M, Nielsen P. Signaling circuits in early B-cell development. Adv Immunol 2014; 122: 129–75. 38. Raman M, Chen W, Cobb MH. Differential regulation and properties of MAPKs. Oncogene 2007; 26: 3100–12. 39. Khiem D, Cyster JG, Schwarz JJ, et al. A p38 MAPK-MEF2C pathway regulates B-cell proliferation. Proc Natl Acad Sci USA 2008; 105: 17067–72. 40. Lu R. Interferon regulatory factor 4 and 8 in B-cell development. Trends Immunol 2008; 29: 487–92. 41. Tamura T, Yanai H, Savitsky D, et al. The IRF family transcription factors in immunity and oncogenesis. Annu Rev Immunol 2008; 26: 535–84. 42. De Silva NS, Simonetti G, Heise N, et al. The diverse roles of IRF4 in late germinal center B-cell differentiation. Immunol Rev 2012; 247: 73–92. 43. Ma S, Pathak S, Trinh L, et al. Interferon regulatory factors 4 and 8 induce the expression of Ikaros and Aiolos to down-regulate pre-B-cell receptor and promote cell-cycle withdrawal in pre-B-cell development. Blood 2008; 111: 1396–403. 44. Basso K, Dalla-Favera R. Roles of BCL6 in normal and transformed germinal center B cells. Immunol Rev 2012; 247: 172–83. 45. Calame K. Activation-dependent induction of Blimp-1. Curr Opin Immunol 2008; 20: 259–64. 46. Lin L, Gerth AJ, Peng SL. Active inhibition of plasma cell development in resting B cells by microphthalmia-associated transcription factor. J Exp Med 2004; 200: 115–22. 47. Xu D, Zhao L, Del Valle L, et al. Interferon regulatory factor 4 is involved in Epstein — Barr virus-mediated transformation of human B lymphocytes. J Virol 2008; 82: 6251–8. 48. Matthias P, Rolink AG. Transcriptional networks in developing and mature B cells. Nat Rev Immunol 2005; 5: 497–508. 49. Al-Alem U, Li C, Forey N, et al. Impaired Ig class switch in mice deficient for the X-linked lymphoproliferative disease gene Sap. Blood 2005; 106: 2069–75. 50. Swaminathan S, Huang C, Geng H, et al. BACH2 mediates negative selection and p53-dependent tumor suppression at the pre-B cell receptor checkpoint. Nat Med 2013; 19: 1014–22. 51. Phan RT, Dalla-Favera R. The BCL6 proto-oncogene suppresses p53 expression in germinal-centre B cells. Nature 2004; 432: 635–9.